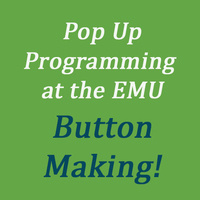 The Student Sustainability Center and Zero Waste are hosting BUTTON MAKING in Oregon Plaza by the "O" Desk. We have many pre-made state and country buttons plus picture samples and the supplies to make many other options. Come join the fun! !